Natalie McGriff, 7, stands next to an image of her comic book, The Adventures of Moxie Girl, which won over $16,000 at One Spark, a crowdfunding festival in Jacksonville, Fla. The odds were stacked against Moxie Girl, but she had already saved the Jacksonville Public Libraries from a wild group of hungry monsters, so beating out 530 entries to win more than $16,000 for her creator would be easy, right? 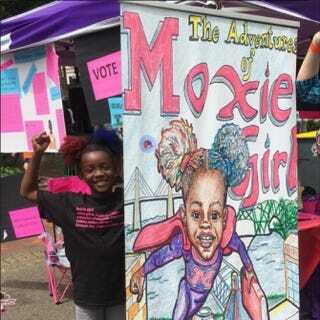 Well, that's what happened after 7-year-old Natalie McGriff took her creation, The Adventures of Moxie Girl—a comic book about a black girl who hates her hair until she uses a magical shampoo that turns her curls into superfighting Afro puffs—to One Spark, a huge crowdfunding festival in Jacksonville, Fla. One Spark attendees pay an entrance fee and then vote on how the money should be dispersed. According to the New Pittsburgh Courier, Moxie Girl was created after Natalie's mother noticed her daughter having hair-esteem issues. "I decided to help Natalie write this book because she was having self-esteem issues regarding her hair and she hated to read," Angie Nixon said in a statement viewed by the Courier. "She now realizes how powerful and awesome her hair is and that in order for her to write a cool book, she needs to read more books and learn different words." In the end, the hero prevailed and Moxie Girl edged out the competition, beating the closest competitor by a mere three votes. Read more at the New Pittsburgh Courier.